Get the facts on this Taco Pasta Toss: Kids love pasta and they love tacos. Put them together and get a surefire dinnertime hit with our Taco Pasta Toss. Meanwhile, brown meat with onions in large skillet. Stir in next 4 ingredients. Bring to boil; cover. Simmer on medium-low heat 3 min. or until heated through, stirring occasionally. Drain spaghetti; place in large bowl. Add meat sauce; mix lightly. Top with remaining ingredients. 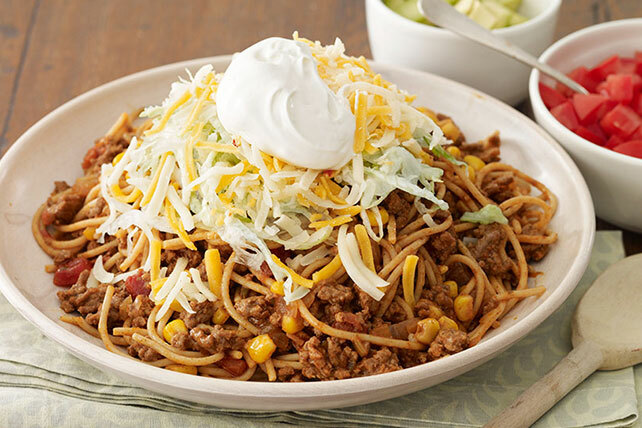 Save 60 calories and 8g of fat, including 4g of sat fat, per serving by preparing with extra-lean ground beef, KRAFT Mexican Style 2% Milk Finely Shredded Four Cheese, and BREAKSTONE'S Reduced Fat or KNUDSEN Light Sour Cream. For added color, flavor and texture, top with one or more of the following before serving: chopped tomatoes, chopped avocados, crushed tortilla chips.